THE University of Cebu completed a Cinderella run as it captured its first crown in the Cebu Schools Athletic Foundation Inc. collegiate football tournament yesterday, dethroning defending champion University of San Jose-Recoletos, 1-0, at the drenched University of San Carlos-Technology Center pitch. From being one of the worst teams in the tournament, UC, which finished the eliminations with three points, won its first title in its first attempt. In previous years, UC was always the first to be eliminated. Right winger Kieth Jireh Arguilles scored the only goal of the match in the 73rd minute. Arguilles was in the right time at the right moment as the ball went to him after a chip shot passed through the hands of USJ-R goalkeeper Joel Cahilog, who dove into the mud for the ball. skills of Michael Fernandez saved UC. 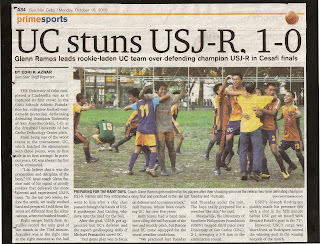 “Our game plan was to focus on defense and to counterattack,” said Ramos, whose been coaching UC for over five years. 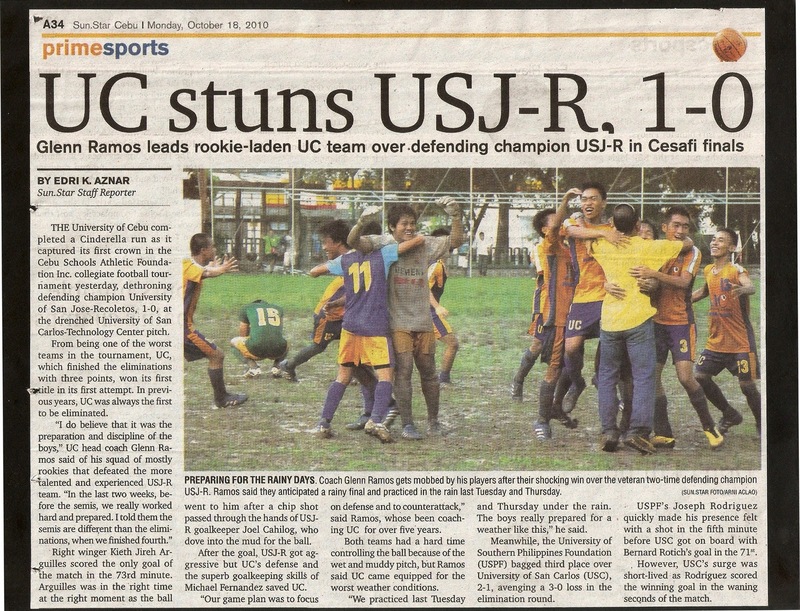 Both teams had a hard time controlling the ball because of the wet and muddy pitch, but Ramos said UC came equipped for the worst weather conditions. “We practiced last Tuesday and Thursday under the rain. The boys really prepared for a weather like this,” he said. Meanwhile, the University of Southern Philippines Foundation (USPF) bagged third place over University of San Carlos (USC), 2-1, avenging a 3-0 loss in the elimination round. USPF’s Joseph Rodriguez quickly made his presence felt with a shot in the fifth minute before USC got on board with Bernard Rotich’s goal in the 71st. However, USC’s surge was short-lived as Rodriguez scored the winning goal in the waning seconds of the match.